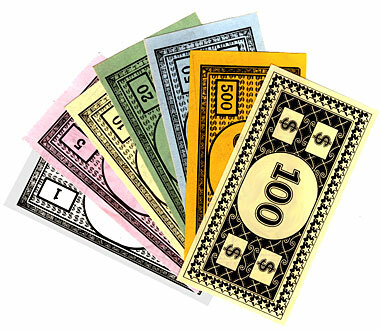 These Monopoly-Style Fake Money Bills are perfect for board games, promotions, and more. Each packet of our Fake Paper Money comes with 30 of each denomination (210 bills total/pack): $1, $5, $10, $20, $50, $100, and $500. The Bogus Bills measure 2" x 4", and each packet of Fake Money comes wrapped in cellophane. Contact us for more information.